I work as a divemaster on a small island. Last weekend some of my coworkers went to the local chamber for “washout treatments,” despite not having any symptoms. We all dive a lot, but I’d never heard of anything like that before. Is that something I should do? There is a misconception among some divers – particularly recreational dive professionals and fisherman divers — that a degree of tissue nitrogen saturation will occur over weeks or months of frequent diving activity. 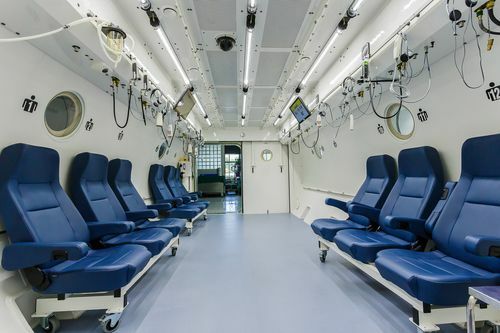 Some of these divers believe they may benefit from occasional “washout treatments” in a hyperbaric chamber, but that is a fallacy. Such a concept is completely at odds with all credible diving and decompression research and is inconsistent with informed clinical practice standards. Efforts to determine the origin of this misunderstanding have thus far proven unsuccessful. Similarly, there are reports of chamber operators actually propagating this myth by offering routine “nitrogen desaturation treatments” – for a price, of course. Decompression sickness (DCS) can certainly manifest as musculoskeletal pain, so any such presentation within 24 hours of diving would warrant prompt evaluation and perhaps treatment in a chamber. However, while chronic pain has many possible causes, diving-related trapped nitrogen is not one of them. Inert gas uptake and elimination during air, nitrox and heliox diving will obey both Dalton’s and Henry’s gas laws. Should bubbles be produced upon decompression (whether there are symptoms of DCS or not), then Boyle’s law also comes into play. Asymptomatic bubbles may remain in tissues for a day or so at most. Throughout the compression phase of a dive and while at depth, the associated increase in inert gas pressure in the breathing gas is delivered to the diver’s lungs (Dalton’s law). From there it is gradually taken up by the blood and delivered to the body’s various tissues (Henry’s law). The rate of inert gas uptake in the blood and other tissues depends on several variables. Key among them are speed of compression, type of inert gas breathed and its related solubility coefficient, body temperature, inherent tissue perfusion and level of exercise or workload. In recreational diving, nitrogen uptake essentially ends once the diver begins his ascent to the surface. I say “essentially” because the body’s “slower” tissues – those that are less well perfused or are supported by simple diffusion, for instance – may continue to take on nitrogen during the early and intermediate stages of ascent if their nitrogen pressures remain lower than the blood’s. Thus, nitrogen in the blood will continue to transfer into these tissues until such time that blood nitrogen levels fall to the level of those tissues. It is at this point that slower tissues will begin off-gassing. This is why it is important that ascents be mostly direct and largely linear. Divers who slowly meander back to the surface may accumulate levels of nitrogen in certain tissues in excess of those assumed by decompression tables. In this way, repetitive dives can lessen the protective capabilities of the table in use. If a diver remains at depth more than 12 to 18 hours (in a seafloor habitat or a commercial oilfield saturation-diving complex, for example), all of their tissues – fast, intermediate and slow – will re-equilibrate with nitrogen (or helium) at the new depth. This is called saturation diving. Except for tiny variations that may occur with body temperature fluctuations, it is physiologically impossible for any additional inert gas to be taken up without further change in depth. When a diver ascends from a saturation dive, inert gas elimination occurs in the same manner as it does at the end of a recreational dive, as described by Henry’s and Dalton’s gas laws.